In Which Regions and Cities Do Food and Accommodation Businesses Earn the Most? Food and accommodation establishments in the Philippines earned an average gross profit (income less expenses) of Php9.6 million in 2015, according to the Philippine Statistics Authority (PSA). But restaurant, bar and hotel owners as well as caterers in Metro Manila earn more compared to those in other regions. Based on data from the PSA, food and accommodation businesses in the National Capital Region recorded an average gross profit of Php14.94 million per establishment in 2015, 56 percent more than the national average. This was followed by Central Luzon, which earned an average of Php7.5 million per establishment. 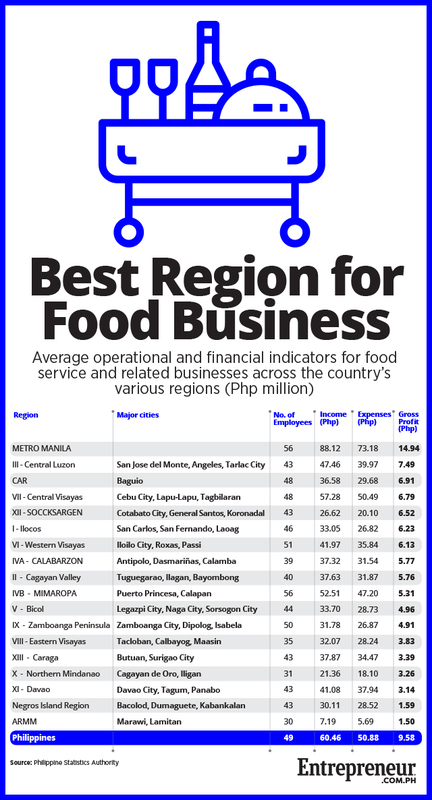 Apart from Metro Manila, all the other regions in the country fell below the nationwide average. Autonomous Region in Muslim Mindanao (ARMM), where Marawi is located, is at the bottom of the list. Food and lodging businesses in the area only earned an average of Php1.5 million in gross profit in 2015. However, when it comes to income to expense ratio, ARMM generated the second highest of Php1.26. It followed SOCCKSARGEN, another region in Mindanao, which generated Php1.32 for each peso of expense. The data came from the Annual Survey of Philippine Business and Industry (ASPBI), which gathered information on close to 40,000 formal business establishments that employ at least 10 workers in the country. The survey included enterprises under the following industries: short-term accommodation activities (hotels, motels, etc. ), restaurant and mobile food service activities, event catering and other food service activities, and beverage serving activities (bars, coffee shops, etc.). Related story: How Much Money Are Restaurants, Bars and Caterers Making On Average?